Many fashion designers and brands are busy these days in introducing their latest winter collections. Fabrizio is a famous clothing brand that has been working tremendously for satisfying its customers. 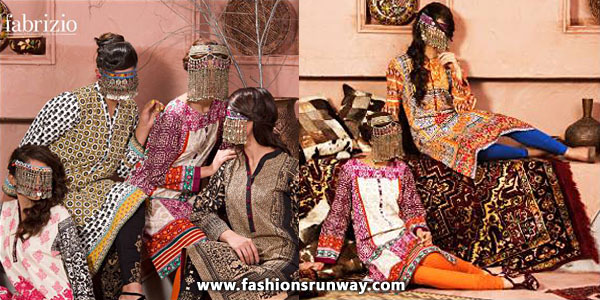 It has also launched newest winter collection 2015-16. This new collection has targeted just females of different ages. Artistic hues, laces and cuts are also used for the embellishment of shirts. Embroidery work is also done for attracting maximum number of customers. Fabrizio winter collection 2015-16 is different from other collections in marketplace. All the dresses included in its latest collection are in accordance with the ongoing cold weather. Creative designs are the main focus of Fabrizio winter dresses along with the combination of both conventional and chic styles. Every dress in this collection is different with respect to designs, color combination and pattern. As we all know that fashion of short shirts has come again, therefore Fabrizio has also introduced short shirts in addition to long shirts. All of these shirts are stylish and young girls will love to wear them. It is the choice of females whether they want to wear trousers, churidar pajamas or cigarette pants. Fabrizio knows well the needs or preferences of their target customers and have designed its winter dresses accordingly. Bold colors are introduced this time by Fabrizio such as red, orange, blue, purple, shoking pink and brown. Fabrizio by Stylo winter collection 2015-2016 is regarded as best for females of all ages, especially teenage girls. They can wear them as either casual or formal. The new collection is now available on all leading stores as well as on their official website. Females living outside Pakistan can also buy these shirts by booking online order. Complete winter collection of Fabrizio is also shown on their facebook page. Check out its latest collection and get your desired shirt. Check below here Fabrizio winter collection 2015-2016 for women, consisting all short shirt designs and kurtis collection.